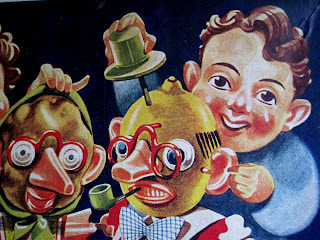 I recently acquired several vintage 1950s-60s West German and English Mr. 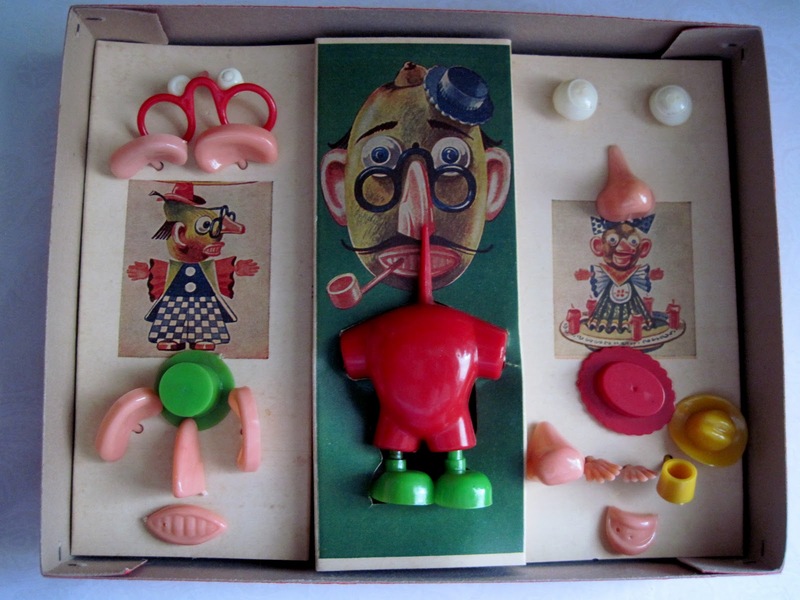 Potato Head sets. Some are knock-offs, some were licensed by Hasbro, but they're all fascinatingly different from their American counterparts. First up: three 1950s knock-off sets made in West Germany. 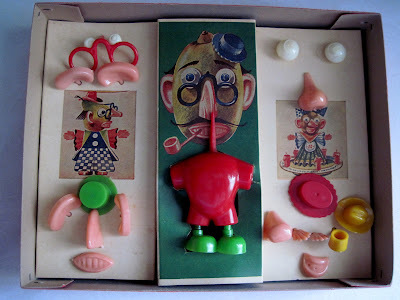 They are all housed in flat cardboard boxes, the same size and shape as those a paper doll set would come in, or a tiddlywinks game. They were released at the time Mr. 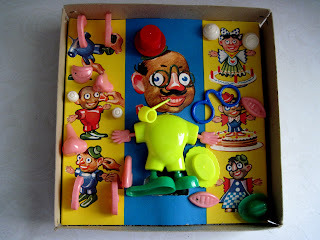 Potato Head still used real potatoes; the toy sets were comprised solely of accessory and limb parts, and it would be several years before the plastic potato was introduced. 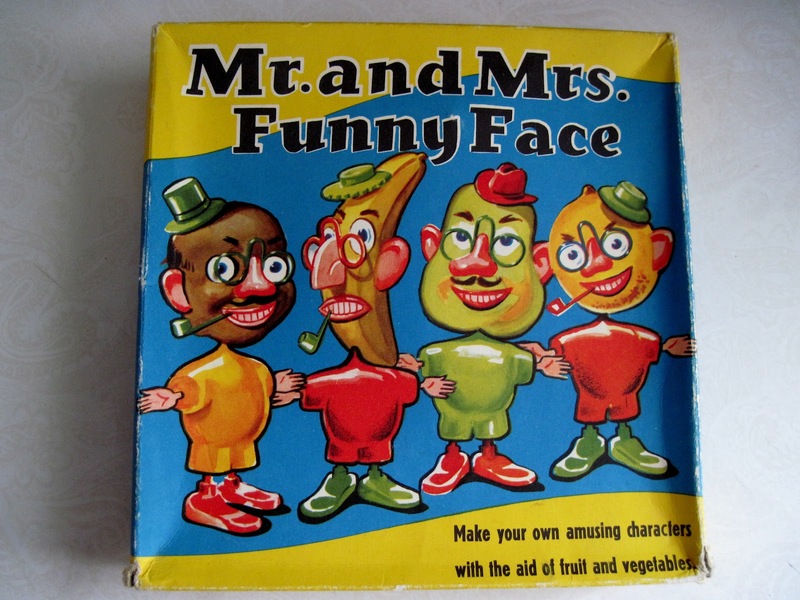 "Mr. and Mrs. Funny Face" features intriguing illustrations of some rather sinister looking potatoes. Inside, the parts are inserted into holes in the liner, and an illustration of an anxious-looking potato head with a Salvador Dali mustache serves as an example of a completed toy. 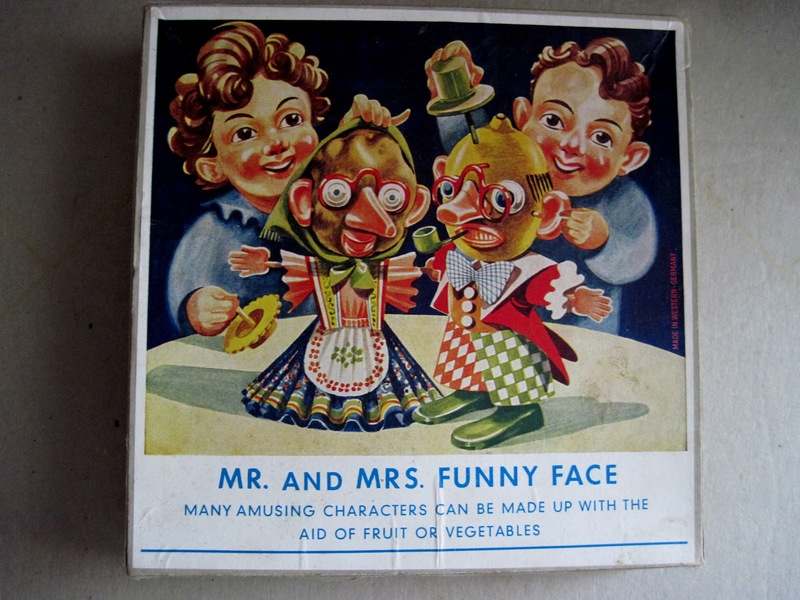 The next West German set features marvelous illustrations of fruit and veggie people on the cover. Kinda creepy Mrs. 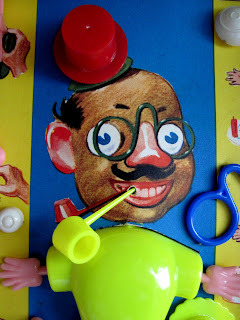 Potato Head, no? 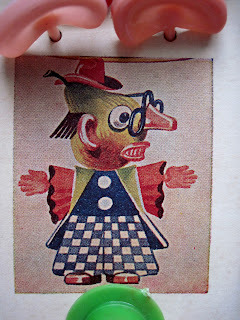 with bright colors and a happier looking Mr. P-Head. Inside the "Mr. and Mrs. 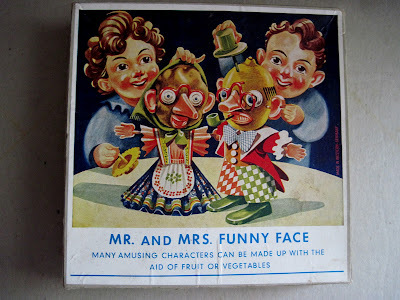 Funny Face" box. 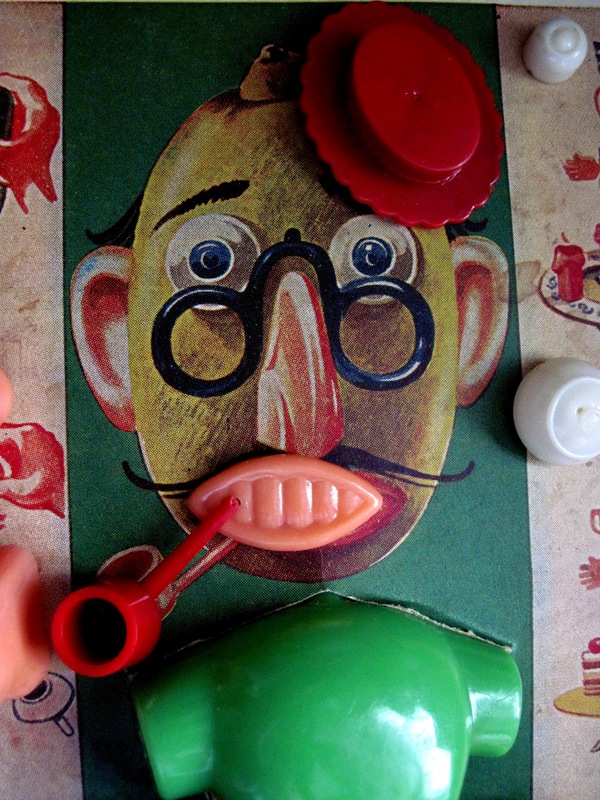 This one's a jolly potato head, with a prominent pipe. Coming up tomorrow: a licensed Mr. Potato Head made in England in the 1970s. Oh my goodness!! Just to die for- I especially adore the German ones. Fabulous artwork. Those must be quite rare over here. Hi Gwen, glad you liked them! They do seem to be rare here: these are the first I've found. 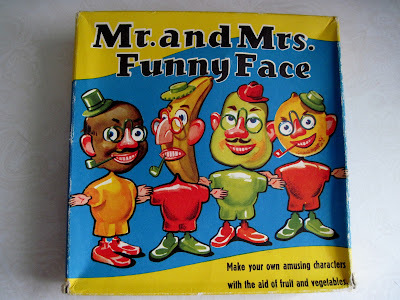 These have even more character than our regular Mr. Potato Head, if that's possible. Guten Morgen, Herr Kartoffel Kopf. 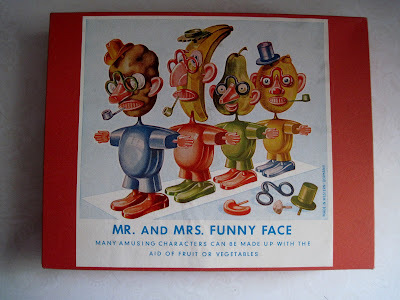 Yep: they are some of the most characterful Potato Head items I've ever seen. While our American Potato Head seems to have a uniformly bland and pleasant expression, these German ones really display a range of emotion and personality, including what appear to be tremendous anxiety and some "crazy eyes". 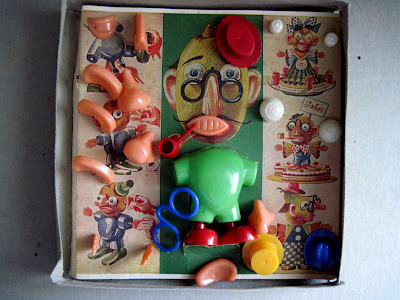 Not sure what that might have to say about our respective national psyches...perhaps that would make a good doctoral dissertation thesis for someone: "National Personality Characteristics as Exhibited in Anthropomorphic Playthings."